Something about Christmas music on the radio this year has left me feeling empty and unsettled. I wasn't quite sure what the deal was. I really like the day after Thanksgiving when I can turn on the radio and give myself over to the holiday spirit. But this year, even the word "holiday" started to bother me deep down. I finally realized that what I was craving this December was a celebration of my Savior, a recognizing of the holy and divine in Christmas. 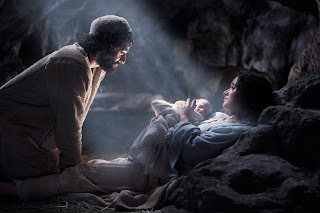 I wanted a quiet and a peaceful Christmas, in which I could commune with the Lord and let Him know that I am grateful for my life and blessings and even more grateful for His life. I've become turned off by reindeer and snowmen, Season's Greetings, and jingle bells. More importantly, I've tried to turn to the true reason for my Christmas. Instead of filling my life with glitter and lights and shopping and cartoons (not that I don't enjoy any of those things on occasion), I've spent my Christmas season so far snuggling at home with my husband in front of our fireplace and tree, making homemade gifts for my loved ones, listening to Christmas songs that praise Christ and His divine birth and mission. And hopefully, at the end of this Christmas, I am more loving and kind, patient and understanding. More like Christ. Thanks Krista. Love the post. Beautiful post from a beautiful person.